In his role as Chief of the Geospatial Section at USACE, Seattle District, Hutsell is leading the USACE/Industry BIM & CIM Consortia in a partnered development of AIM Contract Requirements for civil and military projects. He has over 20 years experience with AEC and Geospatial technology implementation and support at USACE Fort Worth, Europe and Seattle districts, as well as regional military installations. Bush is a licensed professional surveyor and mapper with over 35 years of experience in photogrammetric mapping and surveying, LiDAR mapping, subsurface utility engineering (SUE), conventional land surveying, BIM, civil information modeling (CIM), 3D modeling and LiDAR technology. The lines between survey data capture, building and civil information modeling, GIS and CAD are vanishing, according to the speakers. Helping to bridge those boundaries are National BIM, CAD, GIS and evolving CIM standards. While integration and interoperability have been talked about for years, both Hutsell and Bush see that vision materializing between facilities and infrastructure technologies. Hutsell said the USACE is taking concrete steps towards integrating NBIMS, CAD standards, CIM standards, SDSFIE, OGC and Best Practices, by creating language that can be included in all contracts towards the enabling of that vision. The piece that is most informative to geospatial users is what Hutsell refers to as the “geospatial nexus,” – a conjoining of BIM, GIS and CIM. MILCON has a Nexus example, and the digital mashup analogy for the nexus is as follows: content containing media drawn from pre-existing sources, to create a new, derivative work. Their mashup between Google Maps and traffic conditions is available as a mobile app. A mashup of BIM, GIS, topography and imagery allows the effective communication of site and facility logistics. Challenges to building a successful nexus include establishing a ‘single source of truth,’ making sure the data sources are to be trusted, and are current. To manage this ‘single source of truth,’ the data sources need to be applied in a timely fashion throughout the lifecycle of the project, and must be readily available. A Geospatial repository must be created to support the geospatial lifecycle. Building information modeling’s goal is informed decision making by integrating relevant data sources, using highly reliable data. Hutsell talks about the OGC as the “data wrangler,” with its ability to excel at data integrity and integration structure. 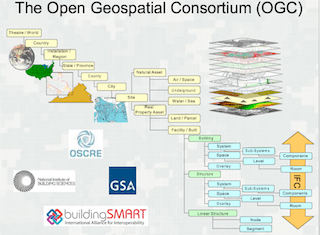 “OGC standards support interoperable solutions that “geo-enable” the Web, wireless and location-based services and mainstream IT,” said Hutsell. 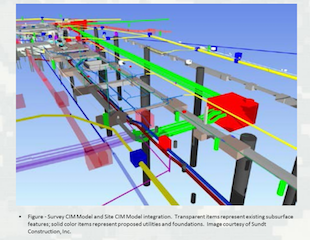 For those unfamiliar with Civil Information Modeling, it is similar to BIM but is a 3D fully attributed digital representation of natural and manmade features, and functional characteristics of a project site. It is typically horizontal construction, while BIM is more vertical construction. The CIM Consortium was formed in summer of 2012 in order to apply the same benefits of BIM to the site design and construction requirements, to create CIM standard processes and contract requirements, and survey deliverables need to support 3D site design and construction processes and tools (the latter was not entirely important to the industry.) This Consortium was formed to help close the gap between BIM and GIS, and to make use of industry innovations such as MAP 21, LandXML, CityXML, TransXML, and InfraGML and IFC. Survey CIM: Existing conditions 3D model, which consist of 3D surface and subsurface geometric content of existing conditions developed by surveyors. Site CIM: Civil/Site 3D model is the proposed 3D site or infrastructure design developed by engineers. Subsurface Utility Engineering (SUE) is an engineering process that establishes a method of discovery and verification of subsurface utility systems. It uses geophysical technology such as Ground Penetrating Radar (GPR) guided by CI/ASCE 38-02, which establishes SUE Quality Levels A-D for defining the quality of utility location and the attribute information. “Good geospatial data is essential in the role of surveying in CIM and baseline/foundation,” said Bush. Adjust the M3 LOD for non-verifiable elements. Over the years, infrastructure has been improving, and BIM has been effecting efficiencies positively and minimizing design and construction risks in building projects for the AEC industry. There is no reason not to apply a similar process to survey capture, site/building design coordination and the construction segments of projects. Putting together the project Survey CIM model with the proposed Site CIM model will provide a comprehensive project CIM model. This entry was posted on Wednesday, May 4th, 2016 at 11:25 am. You can follow any responses to this entry through the RSS 2.0 feed. You can leave a response, or trackback from your own site.